Check out Bungalow co-owner Linda’s gorgeous paradise valley home as seen in phoenix home and garden, June 2015! Linda’s home was recently remodeled with the help of long time friend and Architect C.P Drewett of Drewett Works. 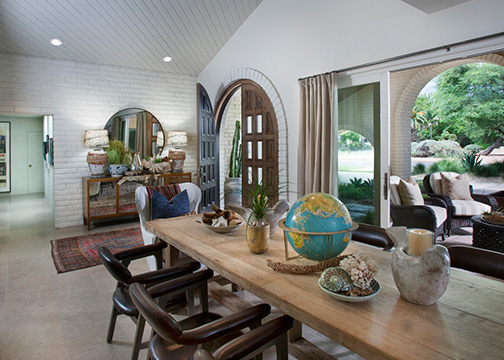 To turn this home into the modern Moroccan world it is today, Linda and C.P had to take this home down to the studs and simplify the overall design and feel of the home. The home was originally built in the 1970’s and was a solid block home, with too many small rooms, too many doors to count, and was very compartmentalized. Linda and C.P concentrated on simplifying the home and opening up the space. 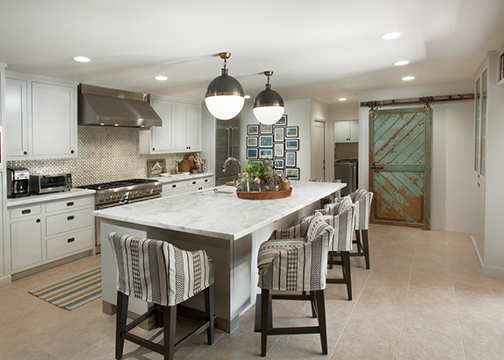 Linda wanted the kitchen to be the heart of the home since she loves entertaining, and the rest of the public rooms took shape with the focus on hospitality and hosting her guests. Once C.P crafted the spaces Linda took charge and decorated. Keeping the space light and open, Linda focused on creating the perfect juxtaposition of textures, colors, and patterns that compliment the new spaces and make them their own. Linda’s collections include a glass-top faux elephant tusk table from the set of the infamous 80’s television series, Dallas. Special thanks to Dino Tonn for the amazing photography!